ZURICH (Reuters) - Nestle (VTX:NESN) expects sales growth to pick up in the next few quarters after slowing to 4.2 percent in local currencies in the first, when unusually cold weather hit sales in North America and cost-conscious Europeans continued to opt for cheaper brands. The maker of Maggi soups and Nescafe instant coffee is facing hard times, with sluggish growth in emerging markets no longer making up for weak sales in the developed economies that account for most of its business. The world's biggest food company said it expected a continued strengthening of the Swiss franc to drag on its reported sales this year. But it said a roll-out of new products was helping to sustain growth in difficult market conditions and it would keep innovating and supporting its brands. Sales in local currency terms in the first quarter rose to 20.8 billion Swiss francs (14.17 billion pounds), short of the 21.46 billion consensus analyst forecast in a Reuters poll. Sales fell 5.1 percent in Swiss franc terms, hit by the relative strength of the Swiss currency. Vontobel analyst Jean-Philippe Bertschy said a greater than expected currency effect was the main reason that sales in Swiss francs missed forecasts, but volume growth of 2.6 percent and price increases of 1.6 percent were above expectations. "We continue to expect a gradual improvement of the underlying performance in the coming months," he said, confirming his "buy" rating on the stock. The first quarter's organic growth of 4.2 percent, which strips out currency moves and acquisitions, was just ahead of the 4.1 percent forecast in the poll, but below 4.3 percent in the same year-ago period and 4.6 percent for the whole of 2013. "We confirm our full-year outlook: performance will be weighted to the second half, outperforming the market, with organic growth around 5 percent," Nestle said in a statement. Sales were hit by several one-off events, including the extreme cold in the United States which made people shop less. Chocolate sales were also weaker in the first quarter because Easter holidays this year fall in April instead of March, which drove consumers to postpone purchases. Bernstein analyst Andrew Wood said accelerating pricing and the Easter impact in the second quarter should help top-line momentum throughout the rest of the year. Nestle generates a quarter of its sales in the United States. In the Americas, sales were up 4.6 percent, helped by strong demand for soluble coffee and pet food in Latin America. Sales in Europe rose only 0.3 percent, as prices continued to fall, while Asia, Oceania and Africa (AOA) grew 7.3 percent. Exane BNP Paribas analyst Jeff Stent said that, while AOA remained sluggish, an acceleration in the water business with like-for-like growth of 6.2 percent was "the main surprise". Nestle said its Nespresso portioned coffee business continued to see strong growth momentum in all markets. It is facing increased competition from rival systems and copycat capsules made by peer Mondelez and others. To fuel growth, it recently launched a large-cup coffee maker for North America. 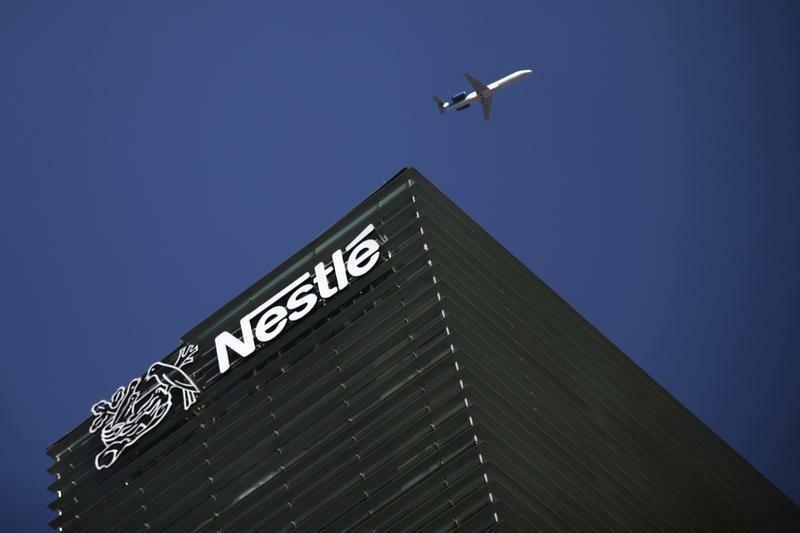 Like some of its peers, Nestle is reviewing its portfolio to get rid of underperforming brands that has already led to the divestiture of the bulk of its Jenny Craig weight management business and its PowerBar energy bars. Nestle shares, which have gained 2.5 percent so far this year, are trading at around 19 times forward earnings, in line with rivals Danone (DANO.PA) and Unilever (UNc.AS) (ULVR.L). Unilever, which also sells soap and washing powder, will post first-quarter sales on April 24, while dairy group Danone's trading update is due on Wednesday. U.S.-based Kraft Foods (KRFT.O) reports first-quarter results on May 1 and snack maker Mondelez (MDLZ.O) on May 7.